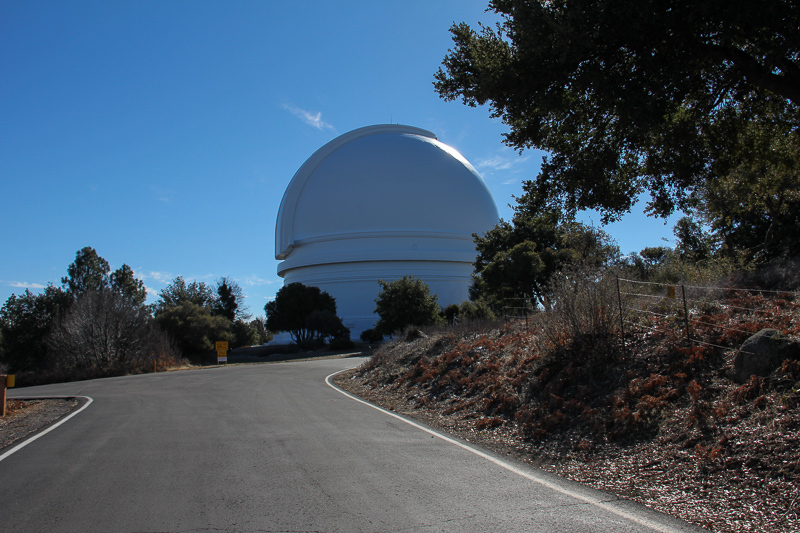 December 20, 2012 - Today's adventure was to head south to northern San Diego County to see the Palomar Observatory, which is a world class center of astronomical research owned and operated by the California Institute of Technology. There are many telescopes here but the most famous is the 200 inch Hale Telescope. 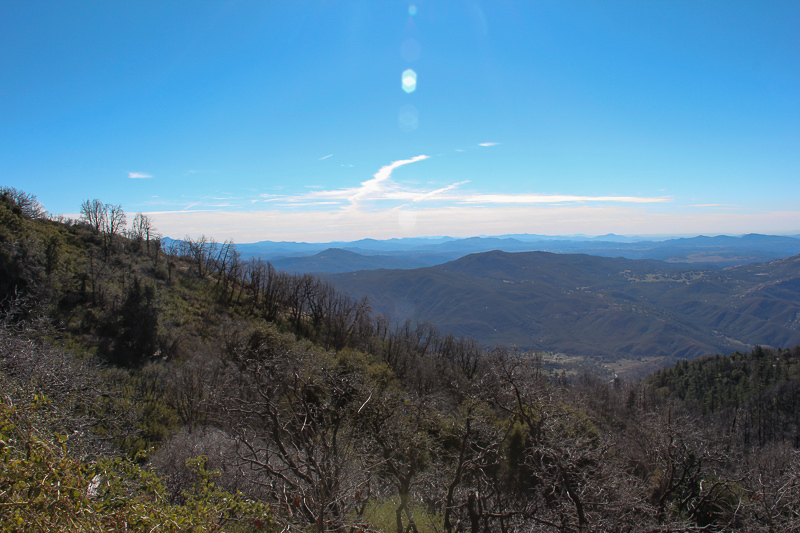 The observatory is located in the Palomar Mountain Range at an elevation of 5,600 feet above sea level, so the scenery on the drive up is quite impressive. 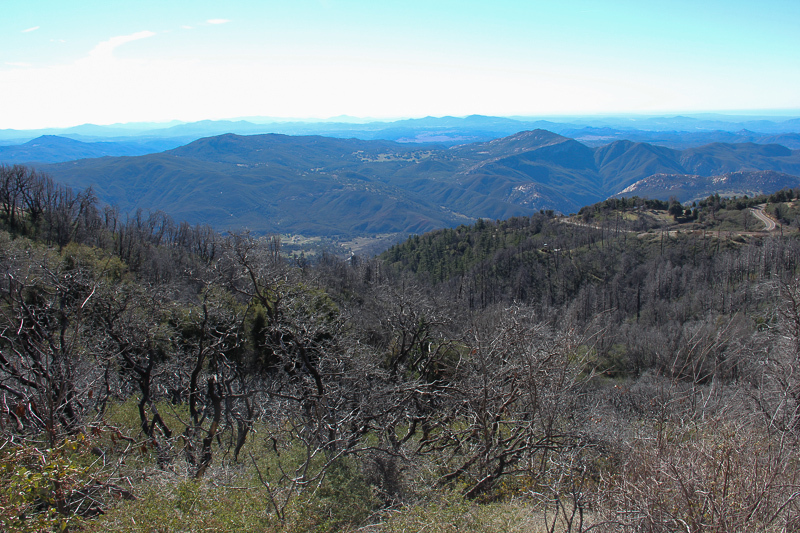 The Palomar Mountain Range lies within the Cleveland National Forest that encompasses almost 460,000 acres. The climate here is Mediterranean and it reminded us of Tuscany as we were driving in. This picture was taken about one mile away from the summit. 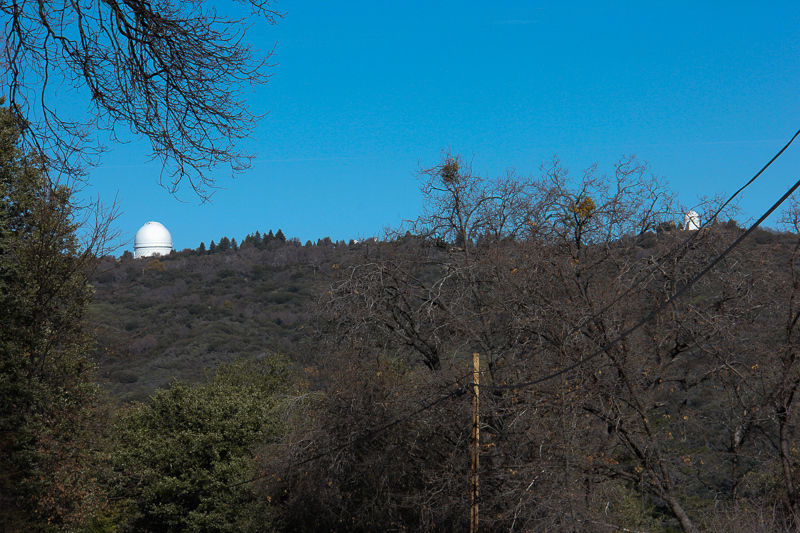 The dome of the 200 inch Hale Telescope is on the left. 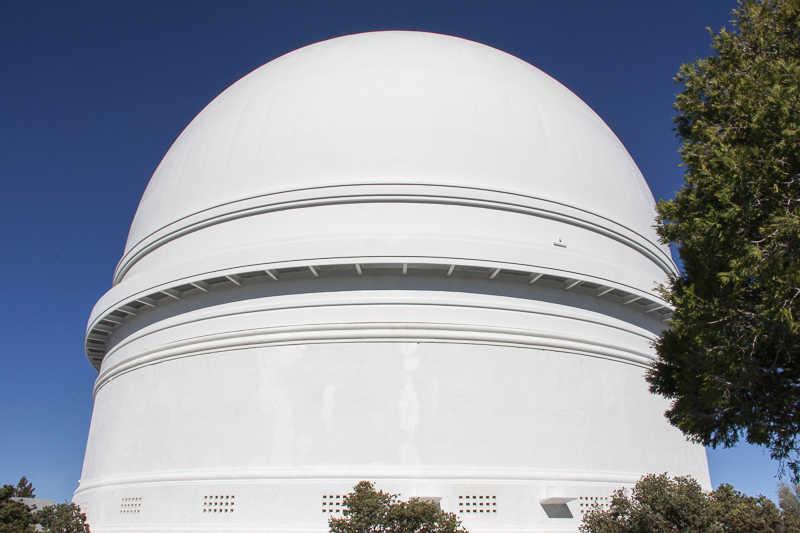 The only dome and telescope that are accessible to the general public is the 200 inch Hale Telescope, which is a short walk from the parking area at the summit. Its Art Deco design is very distinctive and it is a remarkable coincidence that its dimensions are similar to those of the Pantheon in Rome. The dome weighs approximately 1,000 tons, with a plate steel exterior and aluminum panel interior, separated by four feet to allow for dome venting. Two 125-ton shutters cover the opening that slide open at night to allow light through the slit and into the dome. When inside the dome, public viewing of the Hale Telescope is behind a glass observation booth, so there are some reflections showing in the next three pictures. 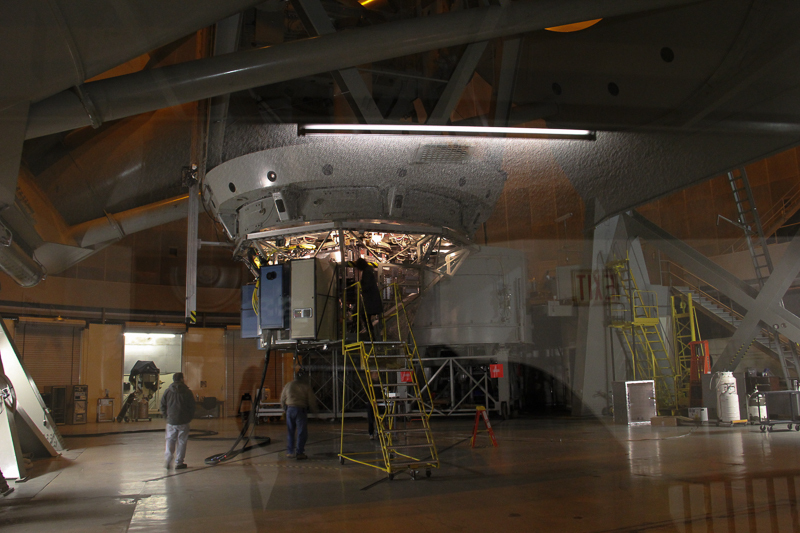 However, this telescope is so massive that the sight is breathtaking. The Hale Telescope was the world's largest effective telescope for 45 years (1948 - 1993). It is still a workhorse of modern astronomy and is used nightly for a wide range of astronomical studies. On average the weather allows for at least some data collection about 290 nights a year. The cylinder shaped object above the workmen houses the 200 inch reflecting mirror, which weighs 25,000 pounds. 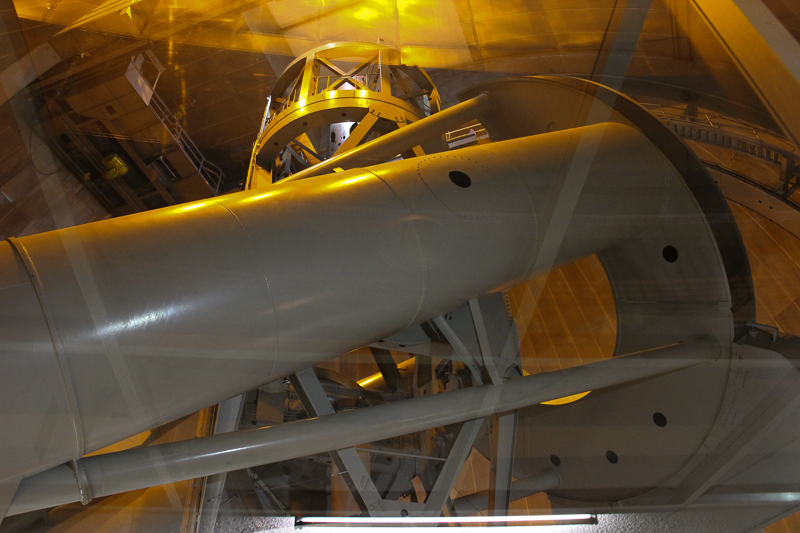 The telescope is in the center of the picture running vertically and the large cylinder in the foreground is one of two equatorially adjusting mounting arms. 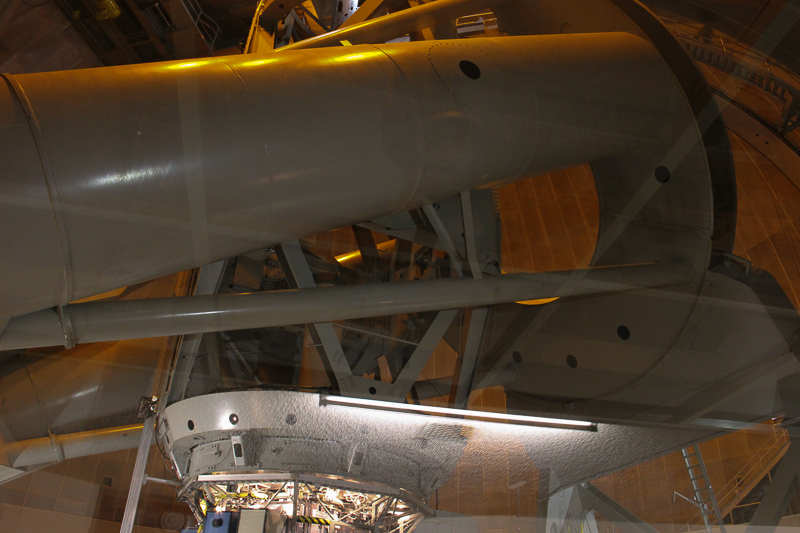 When the dome is opened, this top portion of the telescope, called the "Prime Focus Cage," focuses the light from various distant galaxies to the 200 inch reflecting mirror below. 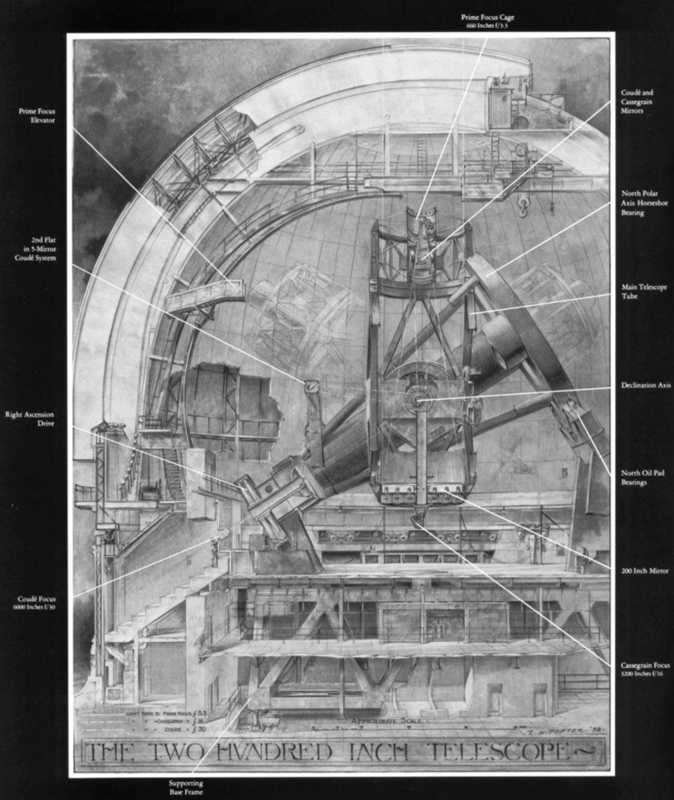 To get a better idea of what this telescope looks like, the picture below shows Russell Porter's 1938 Cutaway drawing of the Hale Telescope. It was quite an experience. On the way back home we stopped at the Pala Casino for lunch and I actually came away a winner for a change.